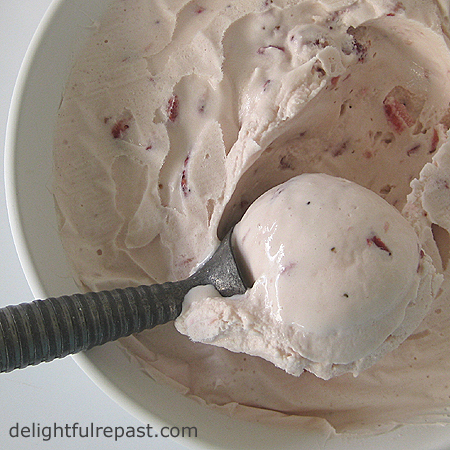 Strawberry ice cream says "Summer" like no other dessert. After missing the boat last year, I was determined to make this The Summer of Homemade Ice Cream here at Delightful Repast. So I finally bought myself the Cuisinart ICE-21 Frozen Yogurt-Ice Cream-Sorbet Maker. Now I'm kicking myself for waiting so long! No rock salt. No ice. It's so easy! First off, wash the lid, freezer bowl and mixing arm. Place the thoroughly dry freezer bowl upright on flat surface at the back of your freezer (where it's coldest) and freeze for 16 to 24 hours, depending on your freezer (which should be set to 0 degrees Fahrenheit). To see if it's frozen, give it a shake. If you don't hear the liquid moving around, it's frozen. I plan to just leave it in the freezer so it's ready to go at all times! 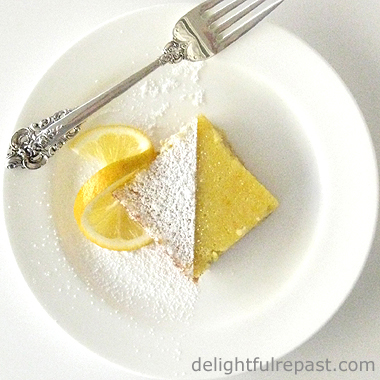 This recipe was adapted from one in the instruction booklet that came with the machine. It's a simple, no-egg, uncooked ice cream. And it is fabulous! Next time I'll try a custard-style ice cream. Or a frozen yogurt. Or a sorbet. I don't know what to do next. I think I need to order at least one more freezer bowl. Can you tell I'm excited?! I use all organic ingredients. If you can't get organic milk and cream, at least get a brand that doesn't have hormones. And, please, insist on organic strawberries. Conventionally grown strawberries are number three on the current list of the "Dirty Dozen" most pesticide-contaminated fruits and vegetables you can buy. Only conventionally grown celery and peaches are more contaminated! 1 By hand or in food processor, chop strawberries as finely or as coarsely as you like. Place in a small bowl; stir in half of the sugar. Let macerate for an hour. 2 In medium bowl (I use a 2-quart glass measure to make pouring easier), whisk together milk, remaining sugar, vanilla and salt until the sugar is dissolved. Stir in the heavy cream, then stir in the strawberries with their juice. Cover and refrigerate at least 2 hours or overnight. 3 Assemble the Cuisinart ICE-21 Frozen Yogurt-Ice Cream-Sorbet Maker; turn it on. While it is running, pour the chilled mixture through the spout. Let mix until thickened, about 15 minutes. I made ice cream like this last summer and it was wonderful!! Then again, any ice cream is pretty wonderful in my book :) Looks fantastic, Jean! Thanks, Jenn! 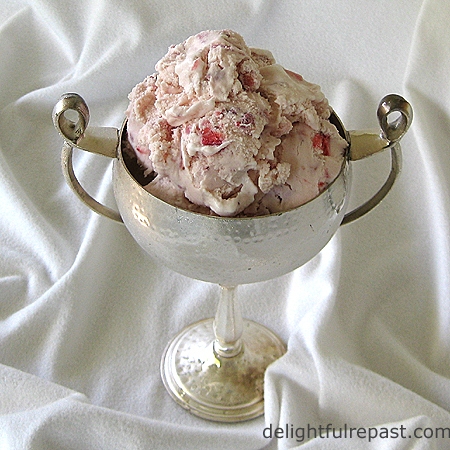 Yep, any ice cream is pretty wonderful, but strawberry is probably my all-time favorite. First of all, the ice cream looks fantastic!! I love strawberry. (and found that I do not have 30-40 strawberry plants from the 3 I purchased last year, I have NINETY-SEVEN!!) Sorry, I digress. Anyway, I would probably eat anything out of that gorgeous silver chalice. That photo is stunning. Okay, and as long as we're talking about favorites, I'll say that mine would be strawberry or cherry nut. Judy, thanks so much! I'm so jealous of you for having 97 strawberry plants (not to mention you-know-who! ), wow! Come back for more strawberry recipes. EQUIPMENT review? We're talking ice cream here, and you are reviewing the equipment? Ah, well, the world is supposed to end tomorrow, so maybe you were saving the ice cream nitty-gritty for heaven. The important thing is that you've turned your considerable talents toward true health food. Ever had a Sanders hot fudge Sunday? (Ask your husband.) Or a stroh's burgundy cherry? Why is it beer companies make the best ice cream? Nope, I've never had the famous Sanders hot fudge sundae; but I've heard about it! If I ever have one, it will be at the shop on Mackinac Island! Jean, the ice cream looks sooooooooooo CREAMY! I am not quite a fan of ice creams..but all sorts of fresh summer berries are just too good to miss! Angie, thanks! There really is nothing better than fresh summer berries, even unadorned, just picked, still warm from the sun. This looks just like summer :) I'm so bad I have an ice cream maker and haven't used it in over a year! shame on me. Love summer strawberries, especially the tiny ones that taste like candy they are so sweet. I try to get organic of the dirty dozen too. Kristen, thanks for your comment! I hope you'll get that ice cream maker off the shelf and make a few batches when the weather heats up. Those supersweet little berries are red all the way through, too, unlike supermarket berries! Hey Jean, wow, looks absolutely delicious! We use a Thermomix to make our ice creams and sorbets. Have you ever used one? It's an awesome machine. No, I've never even seen one, but I hear they're quite a marvel--can replace every appliance except the vacuum cleaner! 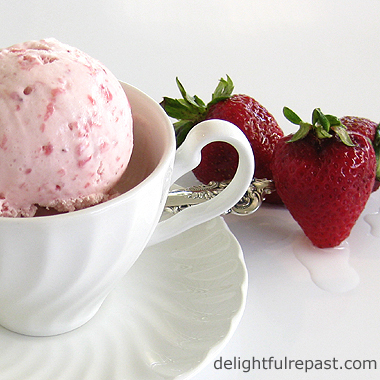 That strawberry ice cream is gorgeous! I have a couple of friends who have that ice cream maker and the ice cream is always delicious. Thank you, Nonnie! I served that at a pink-themed tea party in the garden, and it was a real hit.